& from Belgium / België / Belgique including Herzele. The front laminated gatefold picture sleeve is from a batch printed for the mono edition, and therefore has the catalogue number on the reverse overstickered with the correct 'NSPL' prefix and 'stereo' text. The sleeve is front laminated & remains in lovely condition with minimal signs of edge wear, just a little laminate lift near the spine & all print is clearly legible. The spine has flattened over time but still looks the part, with all sleeve colours still rich & unblemished. There is a small tear at the bottom of the gatefold hinge & some light signs of discolouration from some tape reinforcement inside (which is now no longer present), however this is the only fault and is still a wonderful condition cover. A one owner copy of an all time classic sixties recording! 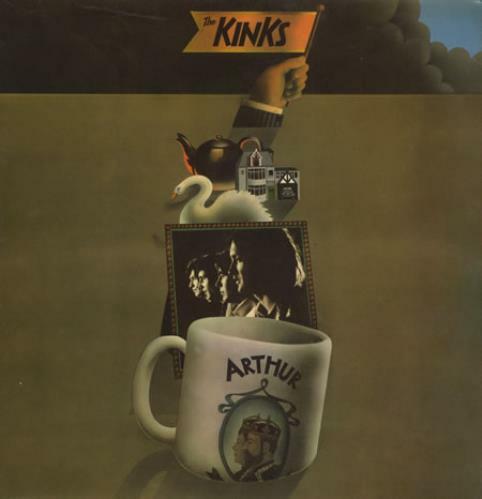 Product Information The Kinks Arthur Or The Decline And Fall Of The British Empire - 1st UK vinyl LP album (LP record).